Lakeview Stitching: 16 Snowmen Blocks Done! I have to say that my plan to randomly select my next project has been a success. Even when I was tempted to start something else over the past couple of weeks, the inital burst of energy from the quilt "lottery" generated enough momentum to carry me through. Fortunately, the chosen project was not very large, so that helped too! 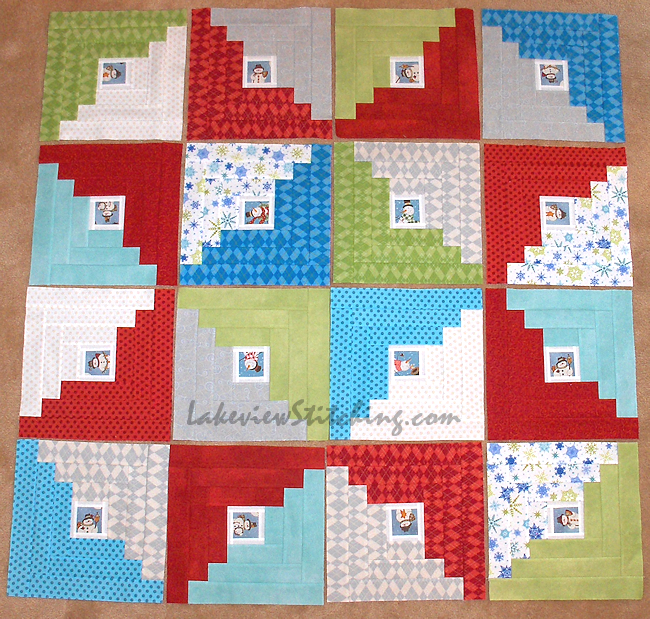 The next step here will be to sandwich and quilt the blocks individually, and then join them at the end. But before I get to that, I have a backlog of projects to quilt. More on that in the next post! Considering that you didn't spend a great deal of time sewing last week, you seem to have accomplished a great deal regardless. Congratulations for finishing the piecing so quickly. The star layout looks perfect and the balance of colours and prints works very well. I'm looking forward to your assembly process. Will you quilt each block individually? Is it quilt as you go? Very curious about the process you will use. Well, my quilting plan is a little experimental, so fingers crossed! I intend to quilt the blocks first, and then join them up. Thanks for the encouragement! looks lovely very pleasing to the eyes, best of luck with the quilt as you go, another technique on the to do list! Oh, I do like this. It's so geometric and harmonious, like a vibrating glass when the right note is hit. Thanks, Jillian! Let's hope it holds up once it's quilted and put together.